September 10th 1961 … the F1 grand-prix of Italy in Monza. A sad day in motorsportshistory.Wolfgang Graf berghe von Trips’s Ferrari collided with the car of Jim Clarck at the beginning of the Parabolica curve.The car crashes into a sand wall next to the track, goes in the air to continue its way in the air to come to an end in the audience.15 visitors were killed in this horrible accident, and 60 more injured. Wolfgang Graf Berghe von Trips was thrown out of the Ferrariand broke his neck, giving him absolutely no chance to survive this horrible crash. Jörg-Thomas Födisch and Michael Behrndt are the authors of this biography, and tell the story of a young man, born in a wealthy andnoble family who’s been passionate about cars and motor sports from his early childhood. He always lived for his passion and soonbecame one of the most popular and famous German race pilots. von Trips was the first German to win a GP after WW II. While reading the book, it becomes clear that it contains well-documented and heavily researched stories, lots of important pictures, some of themnever published before. 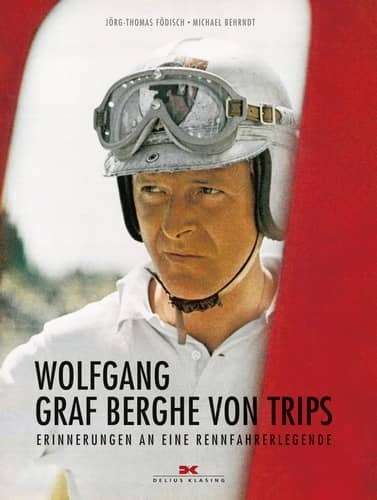 This book learns the reader a lot about an important chapter in German auto sport history, as Wolfgang von Trips witnessedmany of the most important motor sport events in the 50s : victory at the 1958 Europa-Bergmeisterschaft, winner at the 1959 Eifelrennen, competingconstantly against the most famous pilots like Graham Hill, Jack Brabham ,Juan Miguel Fangio, Hans Hermann and many many others.In his career , Wolfgang Graf Berghe von Trips drove the most fabulous cars of many marques like Ferrari, Mercedes-Benz and of course Porsche.